Vitamin D derivatives, are a sixth closely related hormone system with homologous receptors. They have some of the characteristics of true steroids as receptor ligands. occurs in the liver, in other “peripheral” tissues, and in the target tissues. than the natural steroids whose receptors they activate. Testosterone is essential for maintaining spermatogenesis and male fertility. after altering testosterone levels or androgen receptor expression. influx into particular cells and tissues. some steroid hormones as well. benefit rather than a disadvantage. sheep is unlikely to involve actions on brain stem noradrenergic cells. has been on the manner in which steroid receptors activate transcription. the binding of SHBG to RSHBG. KA (SHBG) = Association constant for SHBG and the indicated steroid. binding of SHBG to RSHBG. androgens, on the E2-SHBG-mediated increase in PSA secretion. secretion. of E2 in the hippocampus. this immune cell type which involves neuron-to-glia and glia-to-glia interactions. neuroprotective effects in the CNS in acute and chronic brain diseases. 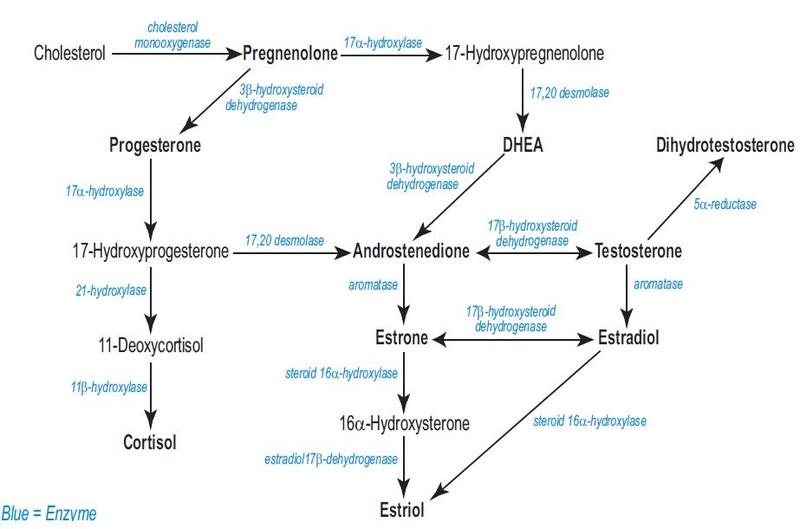 non-classical estrogen and progesterone receptors in a highly dynamic way. regulation of pro-and anti-inflammatory properties including the inflammasome. to study their ability for therapeutic use under neuropathological challenges. and estrogen receptor α in the developing tilapia brain. significantly decreased by constant light but not influenced by constant darkness. very early period of development. that facilitates lordosis converges to deactivate ARH. product known to be activated by androgens, prostate-specific antigen. system that originates, not within the cell, but at the plasma membrane. we examine the effect of E2-SHBG-RSHBG on an androgen responsive gene. with this response element to initiate PSA mRNA transcription and secretion. dihydrotestosterone caused an increase in prostate specific antigen secretion. Laurence Heinrich-Balard, Wael Zeinyeh, Henri Déchaud, Pascaline Rivory, et al. testosterone derivative was performed by an oligoethylene glycol linker. when the plasma hSHBG concentration increased from 4.4 to 680 nmol/L. testosterone concentrations to evaluate androgen disorders in humans. and inactivation in peripheral tissues in both women and men. atrophy in postmenopausal women; (Archer, this issue). local expression of the appropriate steroid forming enzymes; (Labrie, this issue). levels and increased longevity, a subject reviewed by Ohlsson et al., this issue. of life during the menopausal years. and androstane-3α,17β-diol (3α-DIOL), which might be back converted to DHT. tissues from deleteriously high concentrations of DHT, ADT and 3α-DIOL. are potentially useful ligands for the progesterone receptor. to estrogens in male domestic goose during the annual reproductive cycle. explore the role of estrogens in the reproductive tract of male birds. recently found in fish testis and plasma, but its physiological role is still unknown. can differ according to the dose. 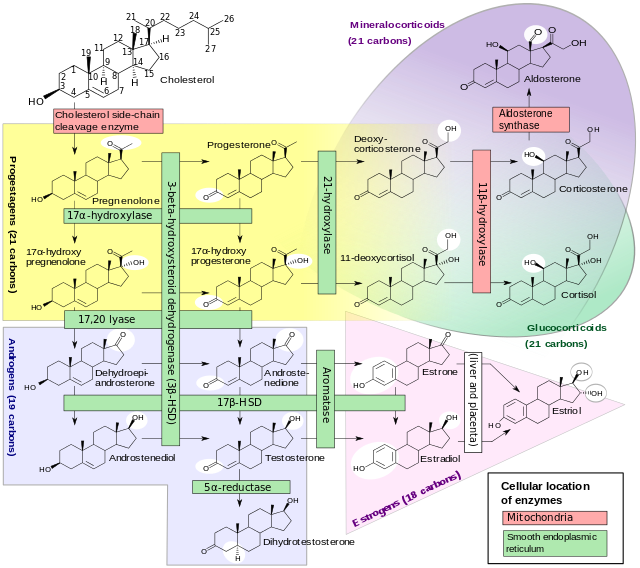 androgens or the capacity to produce them. present study was to describe and characterise the PDEs in the human ovary. was not detected. PDE8B was differentially expressed during folliculogenesis. the major PDEs in the human ovary. recombinant UDP-glucuronosyl-transferases (UGTs) with DES and E2. range of 7.2–7.4 μM, while Vmax values range from 0.38 to 1.54 nmol/min/mg. are not observed in liver microsomes from several common experimental animals. steroids of mainly adrenal origin. They are produced also in gonads and in the brain. and some authors have also reported its role in degenerative brain diseases. as neurosteroids and to prospects for the knowledge of their role in brain disorders. and paracrine growth factor action may mediate some of the effects of androgens. growth factor pathways that promote the sexual differentiation of reproductive organs. Recent studies investigating context dependent AR target genes are also discussed. This article is part of a Special Issue entitled: Nuclear receptors in animal development. local physiological needs without affecting the other tissues of the organism. for the individual cells/tissues without systemic exposure to circulating estradiol. according to the FDA guidelines and the best rules of clinical medicine. Mikhail N. Zakharov, Shalender Bhasin, Thomas G. Travison, Ran Xue, et al. the use of calculated FT (cFT) as an appropriate approach for estimating FT.
vales in females using Vermeulen’s model was also significantly reduced. Jisha Antony, Tanushree Dasgupta, Jenny M. Rhodes, Miranda V. McEwan, et al. derive from its ability to connect distant regulatory elements with gene promoters. of ER-induced transcription and can even restrict enhancer–promoter communication. to achieve appropriate directionality and amplitude of expression. morphological type of breast carcinoma and lymph node metastasis. membrane antigen antibody. Angiogenesis was analyzed using CD 34 antibody. between ER receptors and mean vascular density with p-value (< 0.05). followed by grade II (12.93) and grade I (12.33). who might benefit from adjuvant therapies. previous chemotherapy, with a prolongation of overall survival of 2.2–4.8months. is essentially a blockade of the action or formation of intraprostatic androgens. be involved, especially in very advanced disease. Breast Cancer has been long discussed herein focusing on different aspects of the diseases: from diagnosis and all the way up to treatment modalities (I). The literature has put a lot of emphasis on the role of Estrogen receptor in the development of breast cancer, yet not much focus was placed on the counterpart partner–Progesterone Receptor. Suppresses further maturation of eggs by preventing release of LH and FSH (Follicle Stimulating Hormone). By relaxing the major muscle of the uterus, progesterone prevents early contractions and birth. It thicken the muscle, helping the body prepare for the hard work of labor. A recent review by Prof. Cathrin Brisken from ISREC- Swiss Institute for Experimental Cancer Research, summarizes and highlights the important role of progesterone in breast cancer progression (1). So where do we stand? “The ovarian steroid hormones, 17β‑oestradiol and progesterone, are pivotal in the control of breast development and physiology, and both experimental and epidemiological studies indicate that the two hormones are intimately linked to mammary carcinogenesis”. “Ever since the 1960s, pharmacological antagonists of both estrogen and progesterone were developed. PR antagonists failed in the clinic because of severe side effects, such as liver toxicity. By contrast, drugs that interfere with estrogen signalling, such as tamoxifen and aromatase inhibitors have become mainstays of breast cancer therapy; they substantially prolong survival and have saved many lives”. Agonists for both receptors have been developed and are used for both contraception and hormone replacement therapy (HRT), but there are growing concerns that they may increase breast cancer risk. Women receiving HRT have little or no increase in breast cancer risk when taking estrogens only, in fact there may even be a protective effect (1,3). “By contrast, a substantial increase in breast cancer risk was noticed in women taking combinations of an estrogen and various synthetic progesterone agonists (progestins). This could be related to the increase in cell proliferation in the breast epithelium that has been reported with combination therapy”. These results however differ between women who took natural progesterone and those who received the synthetic form- progestin, which may be due to the fact that progestin may bound other nuclear receptors (i.e androgen and glucocorticoid receptors). Other factors aside from progesterone may advances this higher risk for HRT-related breast cancer and include for example breast density (fatty pad density). “Across species, ERα and PR are absent from the myoepithelial cells and basal cells and are expressed by 30–50% of the luminal cells. Most cells co-express ERα and PR, which is consistent with PR being an ERα target. A small subset of cells expresses either only ERα or only PR”. It was found that cells that are either or both hormone receptor(s) positive may affect neighboring cells in a paracrine fashion by secreting signalling and proliferating factors . Some of the attractive target genes of this hormones include but excluded to WNT, fibroblast growth factors (FGF), epidermal growth factor (EGF) as well as direct intercellular signalling mediated by Notch, ephrins or gap junctions. “Hormone Receptor (HR)+ cells seem to act as ‘sensor’ cells that translate the signals encoded by systemic hormones into local paracrine signals. To relay these signals they secrete paracrine factors that bind to receptors on HR–, luminal and basal cells, which act as the ‘secondary responder cells”. This organizing principle ensures that the signal is amplified and prolonged in time and provides a means of coordinating different biological functions of distinct cell types. Several experiments in MCF-7 cells showed that if a cell had recently been stimulated by estrogens it would be hormone receptor (HR)–. More so, later experiments showed that the HR expression, rather positive or negative, is a hallmark of a distinct cell type in the mammary epithelium. There are many alternations in global gene expressions and protein factors during each menstrual cycle and more over in the life time of a woman. The entire sum of changes in the different cell population determine the proliferation and development of breast cancer. There are two types of proliferation, cell-intrinsic and paracrine proliferation. For example, it was found in mice model, that the cell-intrinsic action of progesterone on HR+ cell proliferation requires cyclin D1. Whereas the proliferation of HR– cells does not (1). Proliferation of HR– cells on progesterone stimulation requires RANKL, which is a tumour necrosis factor‑α (TNFα) family member. It was further noted that that RANKL is a crucial mediator of PR signalling function. It is believed that recurrent activation of PR during repeated menstrual cycles and its downstream effectors, cyclin D1, WNT4 and RANKL promotes breast carcinogenesis (Fig.1). It was found for instance, that use of PR agonists or ectopic expression of RANKL induce mammary tumors in mice models. Therefore, of clinical relevance for example, soluble RANKL administered intravenously can elicit proliferation in the mammary epithelium, and systemic administration of its decoy receptor osteoprotegerin (OPG) can inhibit proliferation (1). There are obviously other genes associated with these phenotypes and the RANKL was given as an example. Novel preventive strategies are envisioned to PR itself and its downstream mediators. The new generation of selective progesterone receptor modulators (SPRMs) used for gynaecological disorders, have fewer side effects than earlier ones, and are thought to be introduced as potential breast cancer therapy. Reproductive hormones impinge on breast carcinogenesis at all stages and can determine whether the disease will progress (Fig 1). In particular, PR signalling has a pivotal role in controlling tumour promotion from the in situ stage onwards. Basal-like: ER-, PR- and HER2-; also called triple negative breast cancer (TNBC). Most BRCA1 breast cancers are basal-like TNBC. Luminal ER-/AR+: (overlapping with apocrine and so called molecular apocrine) – recently identified androgen responsive subtype which may respond to antihormonal treatment with bicalutamide. Claudin-low: a more recently described class; often triple-negative, but distinct in that there is low expression of cell-cell junction protein including E-cadherin and frequently there is infiltration with lymphocytes. The independent prognostic and predictive role of PR expression irrespective of ER has been a subject of great controversy. In their study, Onitilo & colleagues have evaluated numerous patients for different factors such as five-year overall and disease-free survival, recurrent site and age, depending on their subgroups (6). ER-positive/PR-positive tumors >> ER-positive/PR-negative tumors >>> ER-negative/PR-negative tumors. But what happens with the ER-negative/PR positive group? How many patients fall into this category and how important that is? Could it be an artifact? Maleki et al believes that in their study tumor that were initially reported as ER-negative/PR-positive are actually grade I (low grade) ER positive tumors such as infiltrating lobular carcinoma and colloidal carcinoma (7). Reproductive hormones impinge on breast carcinogenesis at all stages and can determine whether the disease will progress. In particular, PR signalling has a pivotal role in controlling tumour promotion from the in situ stage onwards. It will therefore be a good opportunity to design new treatment strategies that include selective progesterone receptor inhibitors. Interfering with the breast-specific effects of increased serum progesterone levels may be an effective way to reduce their risk of dying of breast cancer without blocking all reproductive function.More so, the majority of the physicians and researchers would agree that more studies are necessary to refine IHC classification for better classification and clinical use. 3. Anderson, G. L. et al. Conjugated equine oestrogen and breast cancer incidence and mortality in postmenopausal women with hysterectomy: extended follow-up of the Women’s Health Initiative randomised placebo-controlled trial. Lancet Oncol 2012. 13, 476–486. Heart Risks and Hormones (HRT) in Menopause: Contradiction or Clarification? “The results provide reassurance for women who are recently menopausal and taking hormone therapy for short-term treatment of menopausal symptoms,” the group concluded in the release. The need for reassurance stems from results released a decade ago from the Women’s Health Initiative (WHI), which showed an elevated risk of cardiovascular disease, stroke, and thromboembolic events as well as breast cancer with estrogen plus progestin. Menopause organizations largely recommended “the lowest dose for the shortest time” but have started backing away from that stance, instead endorsing a more flexible approach based on type and timing of hormone therapy. “However, the absolute numbers of such events were extremely small in all three treatment groups, making definitive conclusions impossible,” the researchers acknowledged. But that wasn’t the point of the trial, said Manson, who serves as chief of preventive medicine at Brigham and Women’s Hospital in Boston and is outgoing president of the menopause society. The question that KEEPS is now answering is how perimenopausal women should approach management of menopausal symptoms — if relatively short periods of hormone therapy are safe, noted Sharonne N. Hayes MD, of the Women’s Heart Clinic at the Mayo Clinic in Rochester, Minn. So it may be enough that these risks weren’t substantially elevated in the trial, several experts contacted by ABC and MedPage Today agreed. “The safety of HRT in this newly menopausal population is very reassuring and will likely increase usage as well as demand for HRT in women suffering with vasomotor symptoms,” commented neurologist Cynthia L. Harden, MD, of the North Shore-Long Island Jewish Health System in Great Neck, N.Y., who said the KEEPS data adds nuance rather than contradiction. The results don’t change the post-WHI clinical approach of yearly reassessment targeting discontinuation after a few years of hormone therapy, added Wendy Vitek, MD, an ob/gyn at the University of Rochester Medical Center in Rochester, N.Y. There were some differences between the Women’s Health Initiative and the KEEPS trial that may lead to real differences in outcome, though, researchers suggested. The patch didn’t affect any lipid levels, but it did lower insulin resistance, which the oral form did not. But that’s not necessarily reassuring with regard to cardiovascular outcomes for this younger group of women, Jacques Rossouw, MBChB, MD, chief of the WHI Branch of the National Heart, Lung and Blood Institute, noted in an email to ABC and MedPage Today. Really, “the lack of effect on atherosclerosis reinforces the results of the WHI that hormone therapy is not good preventive therapy for heart disease,” added Lewis H. Kuller, MD, DrPH, of the University of Pittsburgh. “KEEPS also highlights the need for individualized decision making about hormone therapy, given that oral conjugated equine estrogen and transdermal estradiol may have different profiles of effects, and different women have different symptom profiles and priorities for treatment,” the researchers noted in the press release. About 90% of Kronos’ $5.3 million in funding in 2010, the last year for which public records are available, came from Aurora. The $4.8 million given to Kronos that year was more than half of Aurora’s total giving. Sperling, who is the foundation’s sole trustee, has a long history of involvement in sometimes controversial biological research involving life extension. He funded a successful, multimillion-dollar effort to clone his girlfriend’s dog in 2007, and later a similar cloning project for house cats. Previously, he had bankrolled a medical clinic in a Phoenix suburb called the Kronos Group — not related to the Kronos Longevity Research Institute — that offered anti-aging remedies to older patients. It has since morphed into Kronos Optimal Health, which markets relatively conventional health and wellness programs to employers and individuals. Manson JE, et al “New findings from the Kronos early estrogen prevention study (keeps) Randomized trial” NAMS2012. Crystal Phend joined MedPage Today in 2006 after roaming conference halls for publications including The Medical Post, Oncology Times, Doctorâ€™s Guide, and the journal IDrugs. When not covering medical meetings, she writes from Silicon Valley, just south of the San Francisco fog.